Quirky Ties from General Knot & Co.
A few weeks ago I included a link to General Knot & Co. in my weekend round-up post, but I thought it would be fun to do a whole feature with some of the designs I like most. Plus, one lucky reader will win a $100 gift certificate to General Knot & Co., so that’s fun too! General Knot & Co.‘s neckties, bow ties and pocket squares are made from fine vintage fabrics with unique prints and patterns. Each design is a limited edition, made in the USA, and frankly, they make me want to start wearing neckties. I especially love that there are reverse designs of each tie – I imagine one for the groom, and then groomsmen in the reverse. How about a whole set for your wedding party? Here are some ties that a groom commissioned for himself and his attendants. Each tie is different, but the coordinating colors create a cohesive look. What a fun one-of-a-kind gift for your groomsmen! How about corresponding neck ties and bow ties for the wedding party? Outfit your gents! Leave a comment here telling me your favorite item available at General Knot & Co., and a randomly selected person will receive a $100 gift certificate. You have until Thursday at 5:00pm Pacific time to enter, and I’ll announce the winner on Friday morning. Update! This contest is now closed! This is exactly what I’ve been looking for!! There is this vintage spring plaid tie that is just darling. I wish I saw more yellow based ties on the shop though! Wow! I cannot decide on one favorite, I love too many… but it’d definitely be from the print or vintage necktie section! LoVE. I love the Tonal Green Check & Navy Chambray Two Tone Tie. My colors are Green, grey, and white. The guys will be wearing grey suits, but sometimes it’s hard to find green ties that don’t look too much like a st. patricks day novelty tie, this one fits the bill perfectly! I LOVE the 1960’s Mini Gingham & Jacquard Plaid Two Tone Tie. How handsome! Just got a promotion at work and need to stock up on ties. Stoked on so many of these! OH! The rose plaid & pink chambray ties would be just-enough-summery-pink to tie the groomsmen together with my lovely bridesmaids (who are wearing all kinds of shades of berry), while keeping the cool vintage vibe alive and well. Thanks for sharing this website! The trickiest part of dressing my wedding party so far has been finding ties for the guys! I love the commissioned set that includes different but coordinating ties and think I might borrow the idea! My favorite piece on the site is the rose plaid & pink chambray two tone tie. Love!! The Navy Mini Dobby & Spring Seersucker Plaid Two Tone Tie is great – soft and classic but still masculine enough for the groomsmen. So versatile and a great gift for the bridal party! I like the two-tone seersucker and folk art tie. Such a great idea. Love the “Depression Era Floral & Plaid Two Tone Tie” but there are lots to choose from! I love the 50’s vintage folk art tie and the web site! Our wedding is on a ranch with a 1950’s feel to it so now I know where to go for the perfect ties. Thanks! I LOVE the Vintage 1970’s Nautical Knot Print Tie and the Vintage 1950’s Folk Art Pattern Two Tone Tie. They’d both look great on my fiance at our wedding! Love the tonal black and navy chambray bow tie or the black chambray and 1950s rodeo plaid tie! I think my man would love anything from them. My favorite one is the Midnight Purple Check & Navy Jacquard Bow Tie. Im getting married next october at Brazil, and I was looking for a tie exactly like that! Its amasing! Love it! i like the black chambray and vintage leaf two tone tie. VINTAGE 1950’S FOLK ART PATTERN TWO TONE TIE. would go perfect with my khaki poplin suit. Loving the vintage 1950s folk art pattern two tone tie! My sweetie would look perfect in it! My favorite is the Vintage 1950’s Folk Art Pattern Two Tone Tie with seersucker pattern on the inside and tail end – such a great combo. Gotta love all those pocket squares too! Plaid two tone chambray tie – DARLING. Just. Darling. My fiance would swoon, even. I love the navy and 1950s pin stripe two tone tie. So perfect for our outdoor wedding! It would be perfect to our weeding in July! I love the navy chambray and 1950’s prep stripe tie! Would love to get that for the husband! I love the Vintage 1940’s Floral & Black Chambray Two Tone Tie. My fiance would drool over it. Whimsical and fun, just what our vibe is. Love the black chambray & vintage 1940’s floral two tone. My groom is wearing seersucker, so I love the seersucker tie with vintage…so lovely. We want to give these as groomsmen gifts! The Red Spring Plaid & Diamond Check Floral Tie goes perfectly with our wedding colors! I adore it, and I’m sure my fiance would, too! I LOVE THE MIDNIGHT PURPLE CHECK & NAVY JACQUARD BOW TIE! My fiance and I are going for bright colors…and lots of them, so I love the Aqua Plaid and floral tie! Perfect for an outdoor colorfest! These ties are great! I would love to have my honey in one of these! Seersucker Plaid & Navy is calling to me currently. so cool! I personally love anything seersucker and the vintage folk art tie! We are searching for this exact thing for our groomsmen. Would LOVE them! Especially love the seersucker two-tone stripe and folk print tie! My favorite one is the Midnight Purple Check & Navy Jacquard Bow Tie. Its amazing! CLASSIC NAVY & PINK CHAMBRAY BOW TIE! love it! all of them men in our wedding will be wearing bow ties, so this certificate would really help the bill! I am so glad bow ties are making a come back, classic and playful! I love these ties. They are simplistically intricate. What a beautiful and creative way to make a tie have more spotlight. I would absolutely love one of the ties for my fiance to wear on our wedding day!! “Seersucker Stripe & Vintage 1950’s Folk Print Two Tone Tie” is one of my favorites and would fit right on my groom for the wedding pictures. (and even after the event. It can be worn many times after). Totally love the vintage 1950’s folk art pattern – beautiful! I would LOVE to be entered into the drawing. My oh my, these are lovely. I like the chambray bow tie! My fiance and I both love all of the bow-ties, especially the Vintage Spring Plaid Classic one! Oh, these are so fun! I’d have to say I’m a fan of the Seersucker Stripe and Vintage Folk Print Two-Tone Tie. I love the TONAL GREEN CHECK & NAVY CHAMBRAY TWO TONE TIE it’s simple, but fun, and matches our colors! 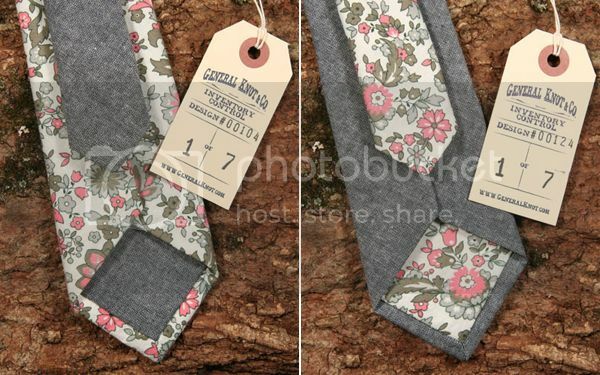 I’m so in love with the “Vintage 1940s Floral & Black Chambray Two Tone” necktie. My fiance is so rad he would definitely rock the pink florals on our wedding day without hesitation! 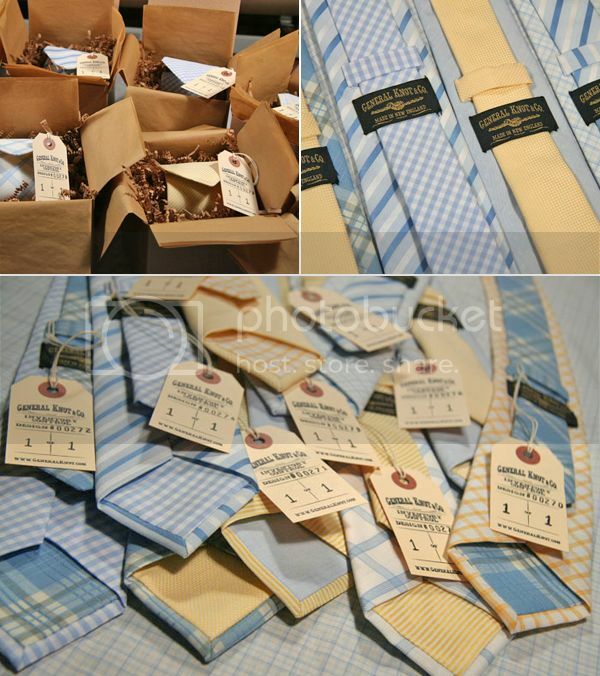 I’d love to see our groomsmen in mismatched ties from General Knot & Co. as well. Thanks for doing a menswear feature! Our poor dudes are so often overlooked on wedding blogs! my favorite is the Geo Floral Print & Navy Chambray Two Tone Tie, perfect for my groom! thanks for the chance! love the black chambray and floral! i love the 1950s spring plaid & navy chambray two tone tie! Besides liking everything ;) I’d choose the tonal black and navy chambray bowtie! I love the 1950’S RODEO PLAID & INDIGO NARROW bow tie! It’s our 1st anniversary soon, and I would swoon if my husband dressed up in one of these classy pieces! ive been asked to play a live guitar set at a friends wedding but i need to purchase equiptment? This is a treasure trove of goodness! I don’t even know where to start, but I can see right away that I’m loving the Navy Chambray & 1960’s geo floral print two tone – not sure if this is the ONE for the groomsmen, but I’m thinking we’re going to buying a few ties from these guys for sure! Loving the Midnight Purple Check & Navy Jacquard Bow Tie! Although all of their prints and patterns are fabulous, my guy is a bit more conservative. This is the perfect balance in between! These are lovely. The packaging is so beautiful! I just adore their plaid ties! If there is one thing my husband is passionate about – it would be ties, and i love these too – particularly the first one! The perfect birthday, anniversary or anytime gift! It’s so hard to find ties that my husband loves, and these fit the bill! My favorite for him would be the black chambray and vintage 1940’s floral two-tone tie. But really, they are all amazing. I love the 1960’s mini gingham & jacquard plaid bow tie. My fiance wears bow ties everyday to work and he has them in all colors and patterns. I love that all your bow ties are two tones…he would love to wear these!! I love the Seersucker Stripe & Vintage 1950’s Folk Print Two Tone Tie–the grey would be fantastic with my fiance’s suit and the seersucker would add to the laidback-ness of our intimate outdoor ceremony. So cute! I actually love the second tie you posted (grey w/ flowers) best of all. Wow, those prep stripe and navy chambray ties are awesome. I think my groom and best best men would L O V E them. 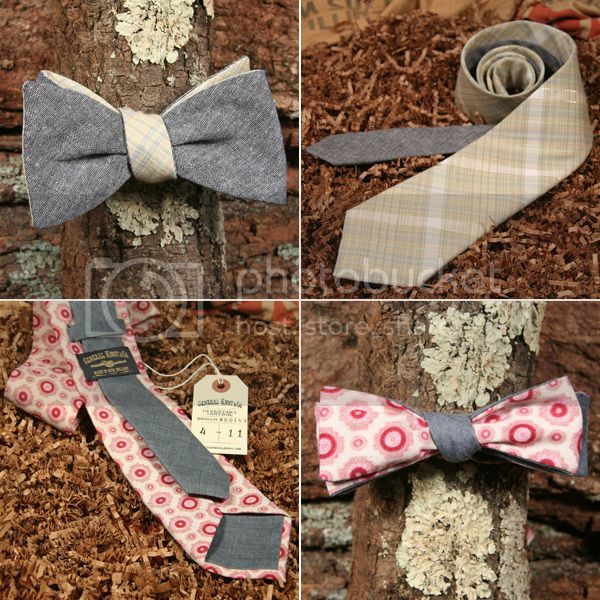 We have been searching high and low for a sweet tie for my fiance – he is going to love these! I think the plaid and mini dobby will be perfect for him. I really love the “nautical knot print” tie. Reminds me of when I used to do magic shows. I always closed my act with the 100 foot rope escape. Fun times! Everything they’ve done with Black Chambray is awesome. But I’m particularly fond of this pocket square. I’m loving the 1950’s Rodeo Plaid & Black Chambray Two-Tone necktie. I love the vintage look and the subtle plaid. They would look great with a gray 3 piece suit! I love the Seersucker Stripe & Vintage 1950’s Folk Print Two Tone Tie! So adorable! They’re all great, but my favourite is definitely the Vintage 1950’s Folk Art Pattern Two Tone Tie. It’s already part of my wedding inspiration file – such a fantastic fabric. Ooh wow! I’m not generally one to go crazy over men’s ties, but I’m swooning over these SO much! I absolutely love the 1960s Mini Gingham and Jacquard Plaid Two-Tone Tie. It’s stunning! But really, all of them are. Love these so much!! What a fun giveaway! The nautical knot print tie would be perfect for my hubby to wear all summer long. I wish I had known about this shop before our wedding! My fiance’s favorite color is green, so I’d like to incorporate that into his suit. I really love the Tonal Green Check necktie. He would look so handsome in that. fav is the Navy Chambray & Vintage 50’s Spring Plaid Neck Tie!! My favorite is the 1950s prep stripe and navy chambray 2 tone. so colorful and cute! I could not love the seersucker stripe and vintage 1950’s folk print two tone tie. We have incorporated seer sucker accents into our July wedding and I know that my fiance would love this. He’s done so much to help me that I would love to be able to give him something I know he’d love. I love the bows on smoke blue & black chambray bow tie! I could not love the seersucker stripe and vintage 1950?s folk print two tone tie MORE (what an important word to leave out! I LOVE it!) We have incorporated seer sucker accents into our July wedding and I know that my fiance would love this. He’s done so much to help me that I would love to be able to give him something I know he’d love. Yep. The chambray and floral is my favorite too. So unusual, perfect for a quirky groom! Thanks for sharing! I love the 1960’S SKY PLAID BLUE SATEEN STRIPE POCKET SQUARE – I am taking a class and learning how to hand embroider. Would love to hand embroider these for my man with his monogram for summer weddings! Thanks! My fiance has yearned for a bow tie for years, but has been too timid to try one. I think the Tonal Black & Navy Chambray Bow Tie would be the perfect “starter” bow tie! 1960s Many Gingham and Jacquard Plaid Two Tone Tie is my fiance’s favorite. He has had quite a difficult time finding a tie he loves for our wedding. This would be a treat for him! My favorite is definitely the 1950’S Prep Stripe & Navy Chambray Two Tone Tie because our summer wedding colors are peach, coral and ivory, with navy and dark brown as accents. This would go perfect! They’re all super cool, but the Vintage 1950’s Folk Art Pattern Two Tone Tie is my fave. I really like the Celadon & Vintage Spring Plaid Two Tone Tie. Our wedding is in August, and we don’t have a particular color–just two patterns: gingham & vintage floral. Every bit of fabric that I’ve purchased has been vintage, and these ties would just be oh so lovely! It’s a hard decision, but I imagine my one and only wearing (& loving) the Country Floral Print & Navy Chambray Two Tone tie. Thanks for the opportunity and feature! the blue and yellow ones are cute! My favourite is the Vintage 1960’s Geo Floral Print & Navy Chambray Two Tone Tie. I love the Diamond Check Floral & Red Plaid Shirting Two Tone Tie. I love those colors together and think they look so sharp paired with a light gray suit. My fiance would love it! Great post! Love these!!! I especially love the “Vintage 1950’s Folk Art Pattern Two Tone Tie”- love the little figures that seem to fade into a vintage pattern. Also love that it comes in its reverse colour combo! Agree with Nicole (above): would look fab with a light grey suit! Nice work again, Snippet & Ink! Adorable!!! What a clever idea. My fiance and I adore the Navy Mini Dobby & Spring Seersucker Plaid Two Tone Tie. These would work perfectly for my groom and his guys. Hidden details are always amazing! I love the Navy Chambray with hidden vintage geo print. Thanks for the feature. What a great place to get unique ties. I LOVE the black chambray and vintage leaf two tone tie, the 1970s vintage green IKAT, and the spring seersucker plaid and navy tie. My fiance is probably wearing a dark gray suit and these would all look great! It was tough to pick out favorites because these are so original! I love how they are all two toned with a unique fabric! My favorite is the seersucker with vintage folk print two tone tie. The seersucker would be so perfect for the men in my New orleans wedding. i’m digging the leaf and black chambray two tone tie. perfect! My fave is the vintage 40’s floral & black chambray tie. Must be someone else’s fave too since it’s sold out! The rodeo plaid and indigo bowtie is a runner up – so cute! I love them all, but the Vintage 1950’s Folk Art Pattern Two Tone Tie is my fave. I love the 1950’s Rodeo Plaid & Indigo Narrow Two Tone Bow Tie! I love the Vintage 1960’s Geo Floral Print & Navy Chambray Two Tone Tie! The Bows On Smoke/ Black Chambray bow tie is so fantastic. Is it awful for a girl to wear a tie? My guy however would love this company. It’s screams his name really. I love this! Much like my fiance’s hair, yes, he totally has a modern mullet, these ties are business in the front and party in the back. The Vintage 1950s Folk Art Pattern Two Tone is so much fun! We’ve been having such a difficult time trying to find unique designs in colors that work! There are some amazing designs here! Love it! I am loving the tie with the grey stripe on the front and the pop of blue and ivory pattern on the inside. I’m a bookbinder and that pattern reminds me of some beautiful end sheet paper I bought in France from the 1940s. Beautiful ties! LOVE the 1960’s Sky Plaid Blue Sateen Stripe Pocket Square. My husband gave me a pocket square (okay, he really just lent it to me when I was crying with happiness and I just happened to keep it!) when we got married a year ago and I will have it with me when we have a larger wedding celebration this fall! I love the “Navy Chambray & Vintage 50’s Spring Plaid Neck Tie” because, well, it reminds me of a mullet: business in the front, party in the back. I love all the two tone ties! I love the Aqua Plaid & 1930’s Depression Era Floral Two Tone Tie. Super bright and hot for spring! Fantastic site! I love theVvintage Leaf & Black Chambray two-Tone Tie. I think it would go great with the grey suits we have planned for my groom and his gentlemen! I love the reversible feature. Thanks for the giveaway! The aqua plaid floral two tone it the best! My groom would love it. The Navy Chambray is my favorite. Thank you! I think my brain just blew a fuse when faced with all that adorableness! The seersucker neckties. The pocket squares. I die. All of these are beautiful! I love the 1950’S RODEO PLAID & INDIGO TWO TONE NECKTIE. 1930’S PATCHWORK & INDIGO CHAMBRAY TWO TONE NECKTIE is my favorite! It was hard to choose, there are so many beautiful ties! Love the Island Red Plaid & Pink Chambray Bow Tie! We’re already thinking of having a custom made suit for Peter. Maybe a custom tie is in order as well! My fave is the Celadon & Vintage Spring Plaid Two Tone Tie. I have been searching high and low for something like this and here it is!! Holy cow, those are so nice! Thanks for sharing the awesome site. I am loving the Vintage 1950’s Folk Art Pattern Two Tone Tie. Also loving the reverse of this for something a little more subdued. But really – I love, love, love them all! Will be getting the fiancee onto their webiste quick smart to pick some ties for him and his groomsmen! My favorite are the bow ties, especially the Diamond Check Floral & Mini Bow Print Classic Bow Tie! Thanks! 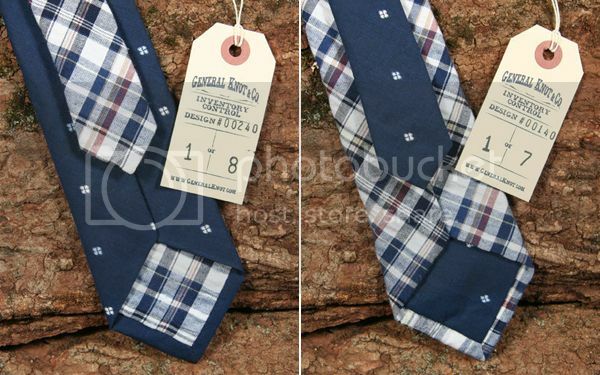 it’s sold out, but i love the 1950’S Spring Plaid and Navy Chambray two tone tie! I love all their vintage plaid neckties! I love the Vintage Spring Plaid and Celadon Two Tone Tie which would nicely compliment the green of my bm dresses and the pale pink in the bouquets and it just looks so fun! Tonight, I will go to sleep and dream of 2 things: my wonderful fiancee, and the perfect Vintage Spring Plaid and Celadon two tone tie! Sigh! I love the bow-ties.. all of them really! Especially the rodeo plaid and indigo one for my fiance. I would just die to see him wear it! i love the blue – gray combo ties!! my all time favorite.. :-) would be gifting my boyfirend if i won.. but probably wear it myself too!! hahah.. The rose plaid and pink chambray two tone tie is super rad. I’d love to see my grown in this at the end of the aisle! Those are amazing! Count me in! I love the rose plain & pink chambray two tone tie – very striking color combo! I like a lot of the more outlandish patterns, but I know that my man would love the navy chambray and 60’s geo-patterned tie. He’ld look good in it too! General Knot & Co is my fiance’s style to a T! My favorite style for him would be the 1960’s Mini Gingham & Jacquar Plaid Two Tone tie. The Rose Plaid & Pink Chambray Two Tone Tie is so cute. I love the 1960’s mini gingham & Jacquard Plaid two tone tie. However, there are a ton of other ones I love too. This website is definitely getting book marked! Thanks for sharing. I love Black Chambray & 1950’s Rodeo Plaid Two Tone Necktie. They are all so fun though! I love the rodeo plaid two tone tie. For our 11-5-11 wedding in Asheville we are going to have outdoor seating on hay bales out in the blue ridge mountains and have the rest of the cruelty free wedding reception in a large home with our closes friends and family. It resonates a historical and out doorsy look. 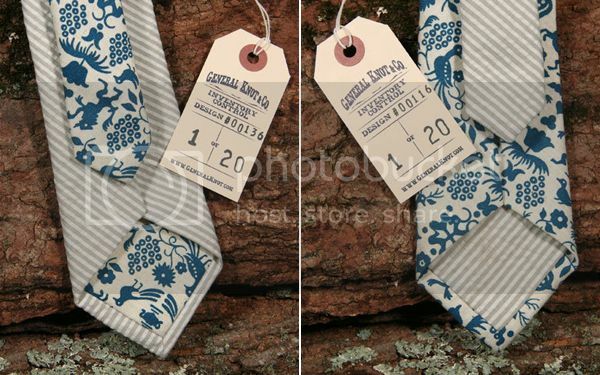 I also love the vintage chambray ties .. Asheville is the home of the Vanderbilts Biltmore house. Very fitting. I love the rose plaid & pink chambray two tone tie – it would look great on my groom for our Mexican wedding! I loooooove Vintage 1950’s Folk Art Pattern Two Tone Tie. I love the variety on General Knot & Co. Beyond the classic tie without being too trendy or ridiculous. I <3 the 1960's Mini Gingham & Jacquard Plaid Two Tone Tie! As a regular bowtie wearing man who’s about to be married the Vintage Spring Plaid Classic Bowtie is stunning. Two of the best things I ever learned how to do were driving stick and tying a bowtie (doing them at the same time requires even more skill). I adore the nautical bowtie, though getting my groom to wear a bow tie will be impossible, as it will make him “feel like Orville Redenbacher”. He does, however, love their nicely cut, slimmer ties…beautiful workmanship.